Make way for Odette, the most elegant ostrich you will ever meet! Her film star looks are so glamorous - she has fluffy feathers in pink and grey, and a long neck, legs and beak in soft grey fur. The pink fluff of her feathers is tipped with mottled grey markings, and she is rightly proud of her unique look! 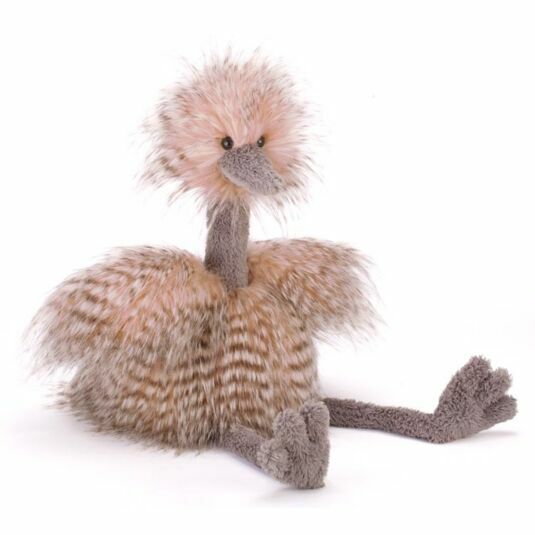 Treat her gently, Odette has the emotional personality of a starlet and when she is flustered feathers may fly! She has a heart of gold, however, and is more than willing to be stroked, combed, preened and cuddled for as long as you like – she just loves the attention! It’s not her fault, but Odette sometimes sheds a little fluff (she’s an emotional type!) so it’s best to wait until your child is 12 months old before introducing this playmate. Hand wash only; do not tumble dry, dry clean or iron. Not recommended to clean in a washing machine. Not recommended for children under 12 months due to fibre shedding.